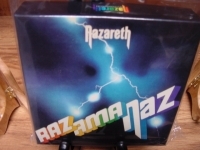 "Nazareth, Razamanaz - Japanese OBI Mini Replica LP Titles Making a 5 CD Box Set - CURRENTLY OUT OF STOCK"
NAZARETH - RAZAMANAZ - Japanese OBI MINI REPLICA LP TITLES making a 5 CD Box Set- LAST INDIVIDUAL BOX SET LEFT FOREVER. Japanese OBI MINI REPLICA BOX SET Japanese re-mastered Mini LP replica Limited Edition Collection Recorded from the finest Original Masters available. Each title Comes with anti-static sleeves similar to Vinyl LPs, Cardboard packaging exact to the original LP, Re-sealable plastic wrap cases for protection of each collectible Actual miniaturized version of the 12" LP in 4" CD version Special VERY RARE LIMITED EDITION BOX SET ONLY PRODUCED ON FUTURES FOR THIS ONE TIME PRESSING -- were only available in Japan. THE BOX SET - INCLUDES RAZAMANAZ - Track Listings 1. Razamanaz 2. Alcatraz 3. Vigilante Man 4. Woke Up This Morning 5. Night Woman 6. Bad Bad Boy 7. Sold My Soul 8. Too Bad, Too Sad 9. Broken Down Angel 10. Hard Living 11. Spinning Top 12. Razamanaz [Edit][Alternate Take LOUD N PROUD - Track Listings 1. Go Down Fighting 2. Not Faking It 3. Turn on Your Receiver 4. Teenage Nervous Breakdown 5. Free Wheeler 6. This Flight Tonight 7. Child in the Sun 8. Ballad of Hollis Brown 9. This Flight Tonight [US Version] 10. Go Down Fighting [US Version] 11. Ballad of Hollis Brown [Edited Version] 12. Free Wheeler [Edited Version] RAMPANT - Track Listings 1. Silver Dollar Forger 2. Glad When You're Gone 3. Loved & Lost 4. Shanghai'd In Shanghai 5. Jet Lag 6. Light My Way 7. Sunshine 8. Shapes Of Things 9. Shanghai'd In Shanghai (Us Single Edit Version) (Bonus Track) 10. Shapes Of Things (Single Edit Version) (Bonus Track) 11. Sunshine (Edit Version) (Bonus Track) 12. Silver Dollar Forger (Edit Version) (Bonus Track) NAZARETH - NAZARETH - Track Listings 1. Witchdoctor Woman 2. Dear John 3. Empty Arms, Empty Heart 4. I Had A Dream 5. Red Light Lady 6. Fat Man 7. Country Girl 8. Morning Dew 9. The King Is Dead 10. Friends (Bonus Track) 11. Dear John (Bonus Track) 12. Morning Dew (Alternate Edit Version) (Bonus Track) 13. Friends (Alternate Edit Version) (Bonus Track) 14. Morning Dew (Extended Single Version) (Bonus Track) 15. Witchdoctor Woman (Bonus Track) EXERCISES - Track Listings 1. I Will Not Be Led 2. Cat's Eye, Apple Pie 3. In My Time 4. Woke Up This Morning 5. Called Her Name 6. Fool About You 7. Love, Now You're Gone 8. Madelaine 9. Sad Song 10. 1692 (Glencoe Massacre) 11. If You See My Baby [B-Side] 12. Woke Up This Morning [Edit][Alternate Take] 13. Love, Now You're Gone [Edit][Alternate Take] 14. 1692 (Glencoe Massacre) [Edit][Alternate Take These are Japanese digitally re-mastered Mini LP replica CDs (the OBI Edition). This Limited Edition Collection has only VERY FEW made world-wide and are immediately Out of Print. Recorded from the finest Original Masters available. Comes with anti-static sleeves similar to Vinyl LPs, Cardboard packaging like an LP, includes extensive Liner Notes Booklet. Actual miniaturized version of the 12inch LP in 4inch CD version.